In 1967, Yerevan gained a number of public statues and memorials. This year marked 50 years of Soviet Armenia, and an obelisk devoted to the anniversary rose along the curves of Saralanji Avenue in commemoration. In the neighboring Victory Park, devoted to World War II remembrance, Mother Armenia also raised her sword in 1967. These two monuments dominated the city skyline, jutting out of its northern center in celebration of Soviet Armenian history. But on a hill just west of these two figures, in a crook of the Hrazdan River and in an entire other chapter of Armenian history, a third monument was erected that year. 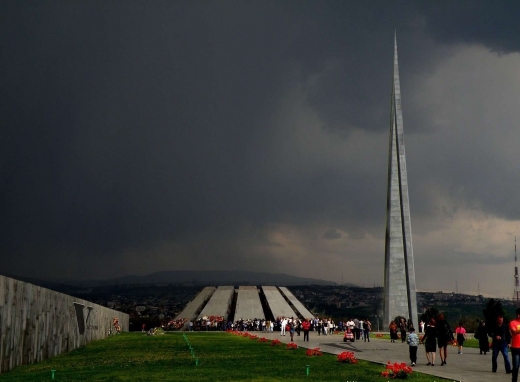 On April 24, city authorities unveiled a monument to the Armenian Genocide as part of the commemorative complex we call Tsitsernakaberd (Ծիծեռնակաբերդ, “swallows’ fortress”), after the hill it stands upon. Today, as the world mark the 99th anniversary of this gruesome event, I find it appropriate to take a look at the commemorative space that unifies Armenians across the world in their mourning. At the time of its unveiling, the monument at Tsitsernakaberd was perhaps the most direct physical manifestation of an ethno-national issue in Soviet Armenia. Stalin’s harsh and chaotic relationship with the genocide as a historical event is widely known, and dialogue about the subject was highly charged through the majority of the Soviet era. This is why it comes as a surprise to many scholars (this writer included) that the push for Tsitsernakaberd was fueled by mass demonstrations in Yerevan on April 24, 1965—the day that Armenians unofficially marked as the anniversary of the genocide even during the Soviet years. 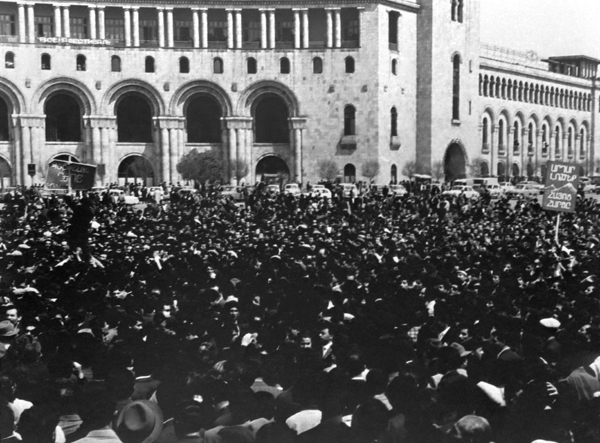 Hundreds of thousands of demonstrators (students and intelligentsia at the core) demonstrated in front of the Opera and in Lenin Square, demanding that the Soviet government allow commemoration of the genocide. Unsanctioned and unprecedented, this was one of the largest demonstrations in the Soviet Union before the dissolution years. Shockingly, it was met not with force but acquiescence from both the Soviet Armenian government and the Kremlin, with construction on Tsitsernakaberd beginning shortly after. A little-known fact is that Armenian First Secretary Yakov Zarobyan was actually involved in discussions of a memorial to victims of the genocide as early as 1964. (For any interested parties, the Party archives reference: NAA, f. 113, op. 96, d. 88, 2. Very interesting year in Party transcripts.) This may explain his readiness to meet the demonstrators’ demand—or rather, not to suppress it with force. We do know that the Kremlin demoted Zarobyan for administrative abuse and “poor ideological leadership” shortly after. Although his successor, Anton Kochinyan, came into office under the auspice of curbing nationalism, he facilitated not only the construction of Tsitsernakaberd but also the memorial complex dedicated to the Battle of Sardarapat, a major Armenian victory against advancing Ottoman troops in 1918. The planning and construction process at Tsitsernakaberd was surprisingly alive with dialogue. Publication records for the mid-1960s show a number of speeches and articles by political leaders, writers, and historians on the issue. The Union of Architects organized a public discussion with more than two hundred attendees to discuss designs and details. According to the Armenian Genocide Museum-Institute, the official design competition called for a design that embodied “the creative Armenian nation’s life that has been full of struggle, its inexhaustible vitality to survive, the progress it has made as well as representing its present and the bright future while eternalizing the memory of millions of victims of the Genocide of 1915.” The winning proposal was designed by architects Arthur Tarkhanyan and Sashur Kalashyan, who also reportedly chose Tsitsernakaberd hill as the locale. To the thousands that march through Yerevan every year from the evening hours of April 23 to the closing minutes of April 24, Tsitsernakaberd is more than a destination. It is a shared experience, a rite. The climb to the top of the hill, twisting through an alley of towering trees toward the eternal flame, is a ceremony of mourning and a pilgrimage of memory. May we remember today, 99 years after the commencement of a great atrocity, all the victims of one of the darkest chapters of our history.